PharmAlytics is a daily tool for busy customers who don’t always have time to look at reports, enabling corrective measures. TCGRx, the leading supplier of pharmacy automation and workflow efficiency systems, today announced the launch of PharmAlytics™ for business; a business intelligence system that helps pharmacies better manage inventories and increase productivity. Designed to work with the company’s ATP®, AVF™, and Beacon® systems, PharmAlytics provides at-a-glance metrics—based on user-defined thresholds—for a single pharmacy site or an overview of multiple pharmacy sites. “On the ATP side, the focus is on production, utilization, and quality. For example, PharmAlytics enables the pharmacy to assess whether the ATP system is packaging the number of pouches/hour they’re targeting, as well as the packager’s idle time. 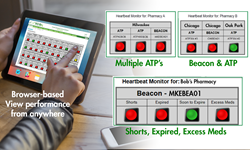 PharmAlytics’s heartbeat monitor provides green, yellow and red visual cues to assess system performance. If the designated alert threshold exceeds user-defined limits, the heartbeat displays red and an automated email alert is sent to the system administrator,” said Duane Chudy, founder of TCGRx. “PharmAlytics provides an at-a-glance performance overview without the need to analyze in-depth reports. Detailed, drill down reporting is also available; providing full details for well-informed business decisions,” he continued. The response to TCGRx’s new PharmAlytics system has been so positive that plans to incorporate two additional TCG modules into the business intelligence tool are already underway. “To our pharmacy partners, accuracy, efficiency, and productivity are key to the success of their business. Our team is continually striving to improve each of these goals by thoughtfully designing and developing products that are second to none in the industry,” concluded Chudy.